Bring your presentation to a huge audience in a large space, and to multi-locations. Touch, swipe, re-scale and erase with the touch of a finger. Print, save and share your results to all participants. 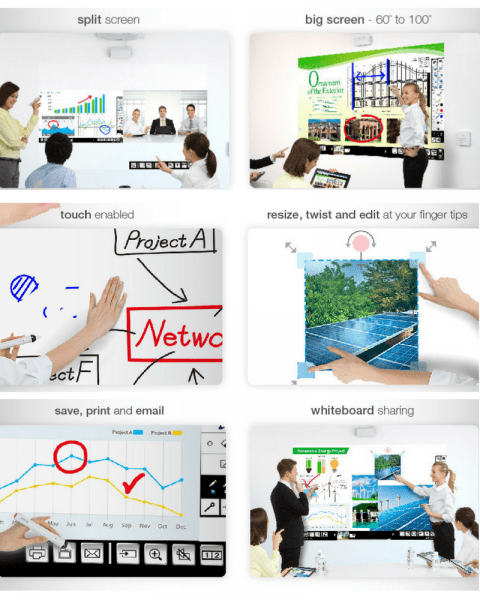 Interactive Projectors are used in many applications in Conference Rooms, Boardrooms, Auditoriums & Classrooms. Move freely around the room without restrictive and confining cables. You can wirelessly display and interact with your content whilst moving around the room. Turn your meeting room or auditorium into an efficient, inspiring place for meetings. Increase efficiency and improve staff morale through collaboration. Increase sales so your customers understand your product or service. We supply and install sound bars and speakers so your lesson successfully reaches the whole audience. We also install Induction Loops for the hearing impaired. Protect your reputation & don’t endure equipment failure during a presentation. Optimise your investment by extending the lifespan of your asset, and saving you money in the long run. No matter the brightness or technology of your Projector, we can supply, service and repair it. Get in touch to find out more.